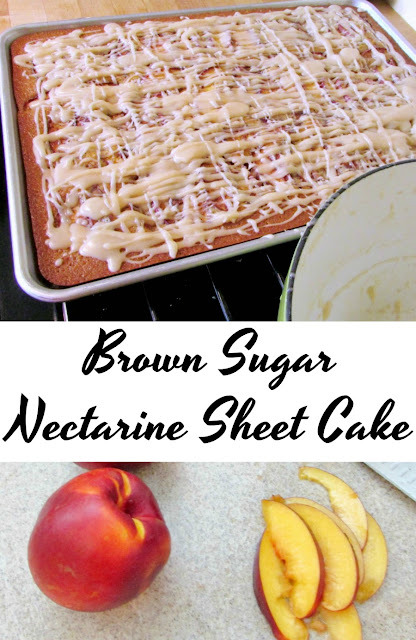 Nectarines or peaches play so nicely with the warm flavor of brown sugar in this simple sheet cake. 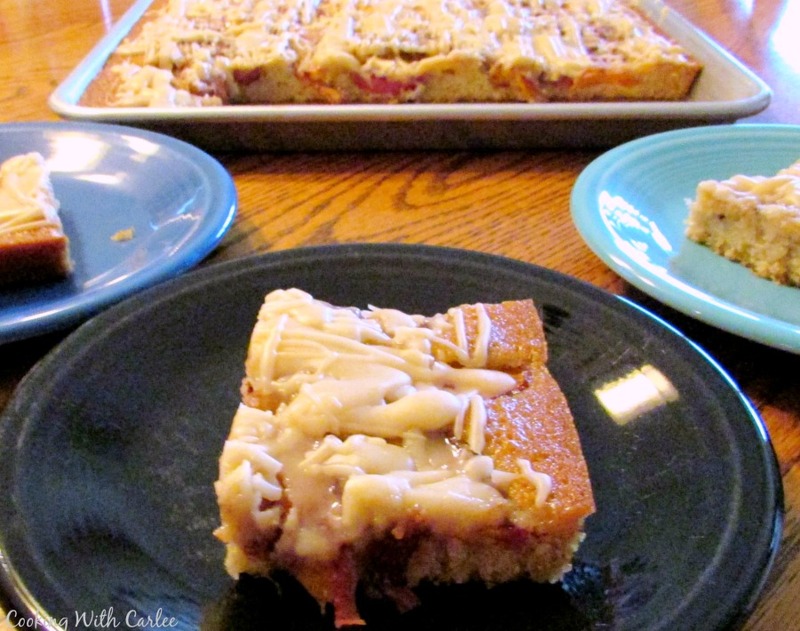 Add a little browned butter glaze for an out of this world flavor combination! 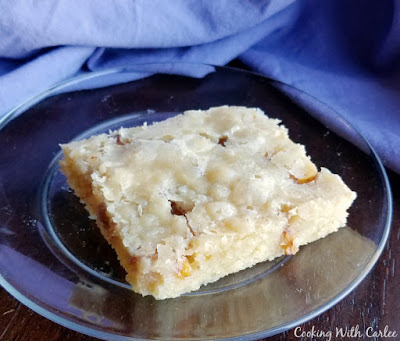 This scrumptious little beauty combines two of our favorite things lately; cooking with stone fruit and sheet cake. The results were amazing! The peaches and nectarines have been so good lately, I can't help but buy some every chance I get. 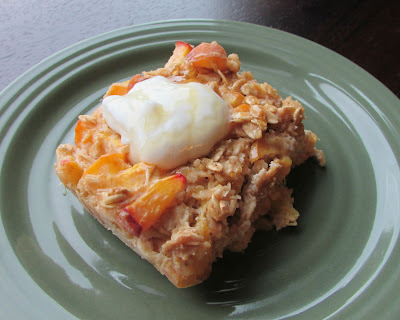 This time I reached for the nectarines, but peaches would work in this just as well. I wanted to bring in some of the warm flavors of fall, but still highlight this late summer fruit. So, I tweaked the recipe for White Texas Sheet Cake to include the warmer flavors of brown sugar and a hint of cinnamon. I wanted to make a sheet cake in the tradition of the Texas sheet cake. So, the batter was made on the stovetop. Just boil the butter and water and whisk in everything else. Then I arranged thinly sliced nectarines tossed in cinnamon and corn starch all over the top. I've actually made this a few times now, both with peaches and nectarines and slice and cubed. While I like the look of slices, small cubes are easier to eat and serve. This cake smelled so good as it baked. Once it was mostly cooled, I drizzled some brown butter glaze over the top. The rest is history! 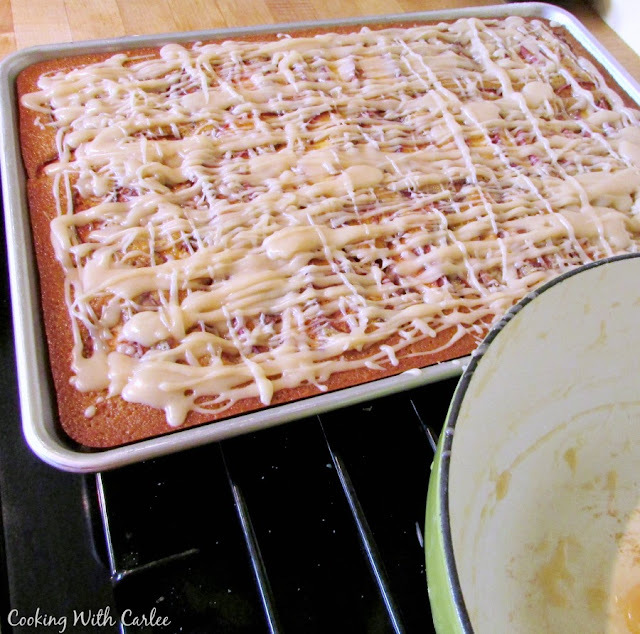 Preheat the oven to 375 F and grease a 13x18x1" half sheet cake pan. In a bowl, toss nectarine slices/cubes with corn starch and cinnamon. Set aside. In a large saucepan over medium heat, bring butter, sugar and water to a boil. Remove from heat. Whisk in remaining ingredients until just combined. Spread in prepared pan. Arrange nectarines over cake batter. Carlee- that looks SO good! Thank you! We really enjoyed it! Me too! It is so fun when stone fruit is in season locally! Thanks for giving us so many great chances to share! I don't think I have ever baked with nectarines before. I usually devour them before I even think of it. This looks divine. 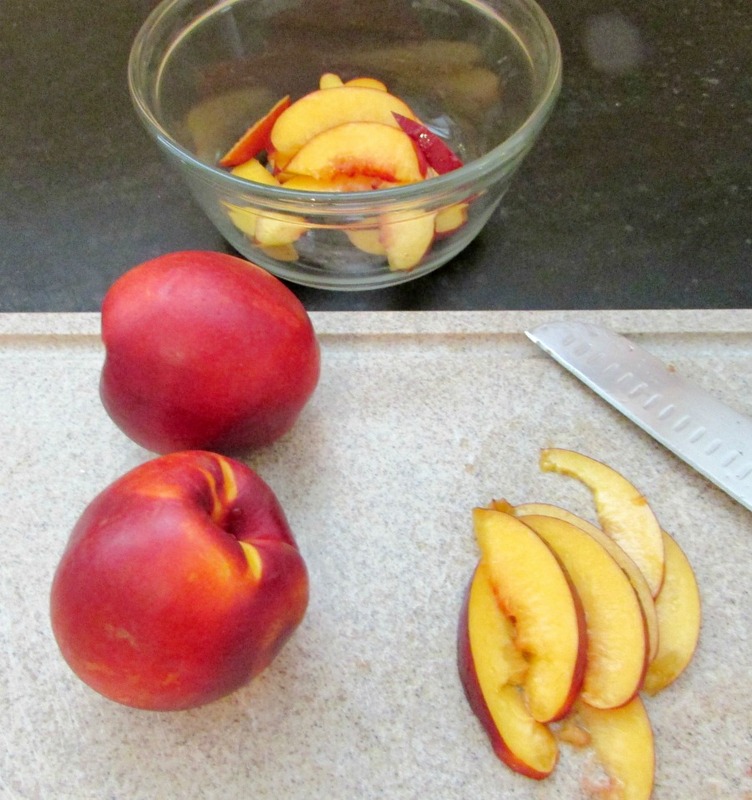 Nectarines usually get eaten pretty quickly at our house too, I had to set a couple aside to play with! Thank you so much for hosting! I have always like peaches and nectarines, but this year I really enjoyed them! I think it is because my little guy loved eating a peach so much. Seeing the juice run down his arms made it that much better. He thought it was so much fun! Thanks for stopping by! Oh My Carlee!! Looks amazing!! Thanks for sharing on My 2 Favorite Things on Thursday...hope to see you again this week!! Pinned! Thank you so much, we really enjoyed it! Thanks for hosting! 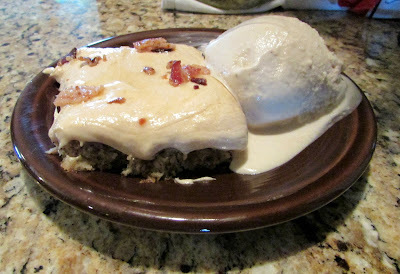 Oh Carlee, not only does this look super delicious, but it looks really pretty too! Loving this recipe! Thanks for sharing at Inspiration Thursday. Thank you! It was really fun to see it go from an idea to a really delicious cake! This looks fantastic, we will love it! Hope you are having a great day and thanks so much for sharing with Full Plate Thursday. Oh my, this sounds wonderful! It was so good. 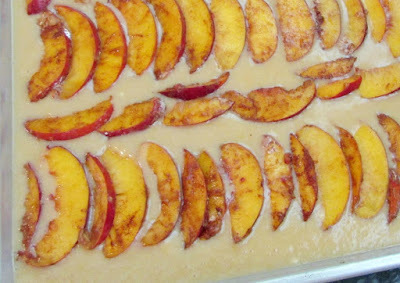 The brown sugar and browned butter went so well together and I have been so in love with peaches and nectarines this year that it seemed like a perfect fit. This looks great, Carlee. I love all those flavor combinations. Pinned and Tweeted. Thanks so much for partying at Snickerdoodle Sunday! Me too, thanks for stopping by and thanks for hosting! On my, your Brown Sugar Nectarine Sheet cake sounds and looks delicious. Thank you for sharing with the Clever Chicks Blog Hop! I hope you’ll join us again next week! It was really good! Thanks so much for hosting, I will see you next week for sure! Oh, this looks amazing! I think I'll be giving this a go! Thanks for sharing with the #BlogFair. Look forward to seeing what you will be sharing this week! It was fun to have it turn out pretty much like I envisioned it. Thank you so much for hosting! This was absolutely amazing! I used nectarine butter and just mixed some into the batter and it turned out great! And that glaze is too good. Yay! I am so glad you liked it! The glaze is dangerous isn't it? !